From now on you can reach us by 0030 699 501 0187 ! The old number will not work anymore. 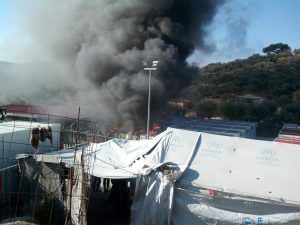 Yesterday some people burned the EASO office inside Moria in protest. The EASO, the European Asylum Support Office is responsible to process the asylum applications in Lesvos, they are supposed to organize the registrations and interviews of the people. In reality the fail on many levels, Asylum processes on Lesbos are unbearably slow. Some people wait now for 9 months on Lesbos without having given an appointment for an interview. 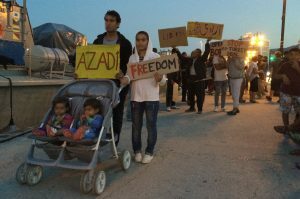 Yesterday on Monday October 24th hundreds of people in Moria protested against this failure of the European Union. Furthermore they protested against the deportations happening in a regular basis on Lesbos. In the curse of the demonstrations fire was set to the containers or EASO, reportedly after their staff left. According to media reports half of the offices burned completely. The majority of the protester have Pakistani origin, one of the groups that is most affected by deportations. Later in the day the police started arresting several people they suspected of being involved in the fire. Also they took the search for this people as an excuse to stop and control people according to their nationality not only inside Moria but also in Mytilini city. What they are doing basically is arresting random people they assume are from Pakistan. While the burning if the EASO office was an act of resistance and freedom the police took this protest to increase Repression once again. We are once again in solidarity with the protesters in Moria camp and everywhere who, literally or not, set Fortress Europe on fire. We believe that the fight for freedom is always stronger than their repression. Freedom of Movement for all! Make Fortress Europe history! As it looks like, the eviction of the Social Center will be postponed for another 10 days. The prolonging of the time until the eviction is due to negotiations with the chief of police. We negotiated for another 10 days but that doesn’t mean that we will leave volunterally after! And also it doesn’t mean that the no border social center will be finished after the eviction. “You can’t evict Solidarity” Campaign calls for support! “You can`t evict Solidarity” is a campaign against repression and for the support of the concerned persons of the evictions of the solidarity- squatting actions in Greece and the following protest actions in July/August 2016. 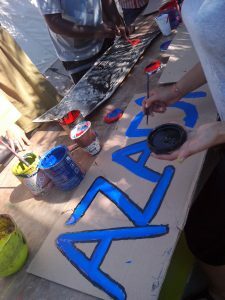 No Border Kitchen Lesvos in solidarity with the “You can`t evict Solidarity” campaign. If you also want to support them visit their blog https://cantevictsolidarity.noblogs.org/! Another eviction coming up. They can evict us but not destroy our solidarity and our rage! Our day started with bad news. Today morning on Tuesday October 18th the police came by to our Social Center to announce the eviction of the place. According to them we will be evicted in 5 days. This eviction would be the 4th eviction of Noborderkitchen this year. What will be destroyed will be not only a few tents on a windy beach but two months work of building a refuge and temporary home for all of us. We will not give up this place so easily! What they cannot destroy, and what they couldn’t destroy in any of the prior eviction is our solidarity and our rage towards the oppression and violence that the people seeking refuge in Europe face everyday on this Island. We were standing together in the last evictions and we didn’t give up. More than that we managed to build something new and beautiful every time they tried to stop us. We will also stand together this time, and we will not stay silent while the state is extending the repression towards refugees every day and trying to destroy all autonomous places refugees on this island build for themselves. 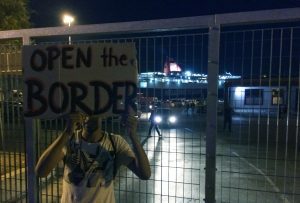 The eviction happens in the same time of the government deporting more and more people back to Turkey, in the same time of the disgusting deal with Afghanistan, in the same time of the erection of more and more walls in Europe and also in the same time of the destroying of other autonomous places like the Calais Jungle. While the Social Center might look like only a beach where people drink tea, its much more than that to all of us. Its a place for friendship, solidarity and resistance. If we have to go, we will come back. Now more than ever we will need your support! With the eviction and also the coming winter we will need more supporters to come and join us. Read our call out here. Also if you can support us otherwise check our blog or contact us by mail. No Border Kitchen Lesvos needs your support! We will need people to come down to support us on the ground from the end of October on as many people will leave Lesvos soon. Read the full call out here and don’t hesitate to contact us with questions! Yesterday’s weekly protest march was much influenced by the latest shameful deal that the European Union has concluded with Afghanistan. The deal allows Europe to deport an unlimited number of asylum seekers with Afghani citizenship back to Afghanistan. Not willing to accept this dodgy deal, around 150 refugees gathered in the center of Mytillini yesterday to protest against it. The treaty with Afghanistan shows that the EU would stop at nothing to keep out people that are seeking for international protection. To declare the war-torn country as safe enough to deport people back to where the Taliban just now has taken over the control in Kunduz again and where currently over 10.000 people are fleeing from, reveals the ignorance and bloody hypocrisy of the European state leaders. To restore the walls of fortress Europe that were shattered by the autonomous movement of thousands of people last year, they are not ashamed to abolish the humans rights gradually. In this week’s protest especially families, women, children and elderly people came to express their anger. 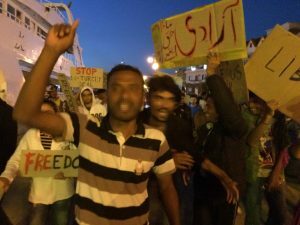 Walking along the harbor, people were powerfully shouting slogans as “Afghanistan is not safe!”, “Stop deportation” and “Moria is prison! Close Moria”. We stopped in front of the police station demanding for freedom and humans rights as illegalized persons are constantly under risk to be profiled and detained behind bars. The continuing march stopped in front of the locked gate to the port. This stopover was symbolic as all persons arriving after the enactment of the EU-Turkey deal are being denied entrance to the port so they cannot get on the ferries that bring them to the mainland. The demonstration ended at the central square of Saphou where the protesting crowd disturbed the daily serenity of inhabitants and tourists sitting in the surrounding cafe’s and bars. We will not stop fighting for freedom! No one is free until everyone is free! Things are moving on Lesvos, but certainly not in good ways. Yesterday 55 people were deported back to Turkey under the EU-Turkey deal which was signed in march this year. According to newspaper reports they were mainly from Pakistan, Algeria and Marocco. Only 15 of these people actually stayed on Lesvos prior to their deportation, the others were brought to Mytilini from the mainland. At the same time the deal between the EU and Afghanistan was signed, that forces Afghanistan to take back an unlimited number of people, whose asylum applications were refused in Europe. Afghanistan´s government was threatened to lose their aid fund granted by the EU, if they don’t sign. This “agreement” was clearly blackmailed and “by-passing formal law-making and parliamentary scrutiny” (Tony Bunyan from statewatch.org). It will lead to a sharp increase of the number of Afghani citizens that will be deported back into a situation of war and violence. Currently they make up the second largest group of migrants arriving in Europe. The deal comes in a time when Afghanistan is not any safer now than it has been in the last 20 years. With the fire breaking out in Moria two weeks ago that received international media attention and the ongoing fragility of the EU-Turkey Deal, the Greek government seems to see itself under pressure to “clean up” the unbearable situation of the overcrowded camps on the islands. Last week, the government announced to bring those refugees whose asylum is most likely granted (e.g. Syrians) and especially families and so called “vulnerable” people to the mainland. There, they are supposed to be “well observed”, which means they’ll be probably lodged in the military camps. While for some it is good news to hear they can get out of the islands, for others it is quite the opposite. They not only remain in a state of isolation and desperation but we also fear that with the transfer of refugees to the mainland a wave of deportations back to Turkey and other countries will hit the islands. 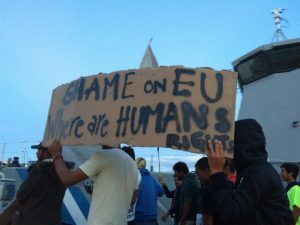 We experience the strategies of EU politics of closing all possible doors to people seeking refuge in Europe as well as their discourse of the division into good “legitimate refugees” and bad “economic migrants” being played out on Lesvos fast. We don’t see any positive developments coming in the future. Most people stay trapped in Greece. 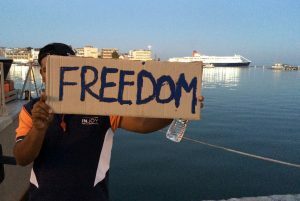 While some groups of people might be able to go to the mainland and get asylum there they will still be forced to stay in Greece against their wish. The fact that they are denied freedom of movement and a choice in which country they want to claim asylum and therefore live (legally), remains true for all people. Groups of people, who are falsely categorized as unpolitical, economic migrants will more and more be deported back to countries outside of Europe. What the European governments deliberately ignore is the fact that there are no unpolitical migrants. All people have their reasons, and many of them have been created by Europe itself. Europe´s leaders close their eyes to these realities. When they classify Afghanistan and Turkey as safe enough to process deportations they clearly show that the EU is not ready to welcome refugees but only ready to welcome people as exploitable labour force to stabilize its own economy and make Europes rich even richer. We demand freedom of movement for all! Stop EU Turkey deal and stop all deportations! Its October and our protests are still going on! Yesterday we started the second month of the weekly demonstrations against borders and for freedom for all! As usually we walked through the center of Lesbos capital Mytilini to the port and back to the city. Shouting “Freedom!” “Open the borders” and “Close Moria!”, we took the streets against despite the repression the Greek State, with behind it the European Death Machine. Yesterday we were especially shouting in solidarity with all our friends in prison in Moria, Korinthos and elsewhere. They couldn’t be on the demonstration today but they were with us in our hearts and our minds. The European Union treats refugees and migrants like criminals, putting them in overcrowded and unsanitary camps, beating them and locking them up in prison. Freedom of movement is not something that should be under the control of any goverment or state. We are fighting against this system of oppression, we are fighting for freedom. And we will not stop until every single person gets their right of freedom of movement, for we are not free until all are free.